As we all return to work from our Memorial Day celebrations, it is important to remember why exactly we had off in the first place. Beyond the unofficial kick off to summer festivities and fun cookouts, we have to remember that the core of this holiday is remembering everything veterans did for our country. Now that many veterans are older, they may need the help of a caregiver or health professional. On many levels, veterans require specialized healthcare. It could be injuries received during service or psychological services. For family members, it is important to understand what they need, but also the resources that are available. Caregivers must make a conscious effort to maintain a veteran's mental health. Like all seniors, when veterans age, feelings of loneliness, anxiety, and social isolation may set in and cause a myriad of health issues. Yet permanent disabilities may further their feelings of dependency and a loss of mobility. Make an attempt to include your aging loved ones in social and family activities. This can help stimulate their brains and help them stay involved and active. 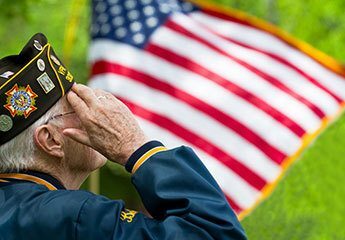 Fortunately, today the Veterans Administration provides a large range of programs and services, which assist veterans and their spouses during their senior years. These benefits o en allow veterans to live in extended care and senior living communities while receiving much needed medical and therapeutic services. Veterans with low income who are permanently or totally disabled and age 65 or older may be eligible for monetary support if they performed 90 days of active service during war time. Several programs provide supportive services for homeless veterans and transitional assistance back into society. Veteran’s benefits are provided to all who were involved in active duty in all wars and conflicts. Many veteran services and benefits are subject to change and apply only in certain cases. Caregivers can find out if their aging loved one is eligible for this help by contacting the US Department of Veteran Affairs.